We might be a large, national removals company today, but deep down we are still the family business that started out a decade ago in PO12, PO10, SO14 and SO31. Over the last ten years the story of our rise from small family business in Odiham to leading UK removals company has been unfolding in London, where we first set up shop to try and offer people a stress free moving experience. We made our name offering simple moving day services in Waterlooville, Kings Worthy, Brockenhurst and Colden Common but since then we have expanded to offer a wide array of optional extras and now service all of the UK and even European relocations. 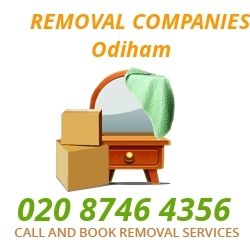 Throughout Odiham our company handled high quality house moves spanning across RG28, GU12, PO12, PO10, SO14, SO31 and SO40.